You’re cordially invited to America’s 240th birthday bash, and eBags.com will help you get the fiesta started! Our deals on fantastic gear this weekend will have you setting off your own fireworks in celebration! Use the code FIREWORKS to save 20% off of our bestselling products site-wide on eBags.com, leaving you with extra cash for sparklers, s’mores, and pool toys. The 4th of July is all about friends, family, and the American escape. The USA is home to endless vacation opportunities. Whether you opt for an all-American road trip across golden plains, or jet setting over rocky mountains to shimmery shores, be sure to pack smart. And packing smart essentially means packing light in smart gear that enables strategic packing. If you’re driving somewhere for the holiday weekend, smaller suitcases mean more room in the car for snacks, fireworks, camping gear and beer. Roadtrips go hand in hand with our nation’s greatest treasure, the National Parks. Celebrate their Centennial this Independence Day – whether you make a weekend out of it, or just stop for a quickie roadside hike or photo opp. Regardless of your outdoor intensity level, you’ll want to pack in a backpack, so unpaved, bumpy trails are no problem. The Osprey Porter Backpack is compact, yet can squeeze 65 liters of gear – perfect for a long weekend. Osprey is loved by outdoor and rugged travel enthusiasts, but what if you’re a more low-key tree hugger? Perhaps you appreciate the great outdoors, but love the comforts of valet and vanilla lattes even more. Then a compromise is in order. 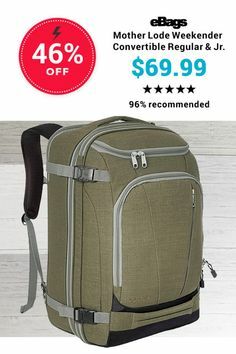 Check out the CalPack Porcia 19” Rolling Backpack, which has the ability to traverse bumpy trails but also function like a typical carry-on. The chic hidden handle allows your back to take a break whenever you reach pavement. From sea to shining sea, boats are ingrained in Americana patriotic imagery. There’s no better place to watch fireworks than on the water, with the explosions reflecting on the water. United we stand, as a nation that celebrates free expression. Stand out with an eBags exclusive, like the Baggallini Unity Tote. It doesn’t get more American than a staple that celebrates unity while remaining one of a kind. 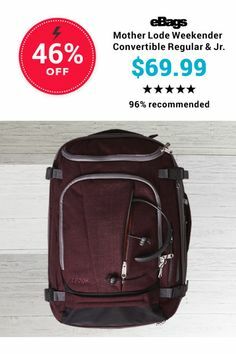 This tote functions like a weekender duffel – with a laptop pocket, tablet pocket, pen pockets, card pockets, and top zip closure– but looks strikingly like a handbag. Its sleek design is yacht club approved. Attach the crossbody strap so you can easily swing it over your shoulder, step on board, and sail away. Colors available include sleek black, charcoal, portobello, or all-American apple red. If you’re flying, packing light is non-negotiable. 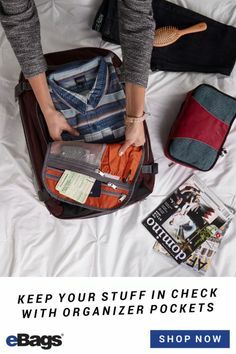 Check the weather forecast and plan outfits beforehand so you can fit everything into a carry-on (sorry pyros, you’ll have to purchase fireworks upon landing). Tow a wheeled carry-on so you can avoid long baggage check lines, exorbitant baggage checking fees, and erase any possibility of lost luggage. Human Gear GoToob 3-ounce bottles let you bring the comforts of home far, far away. Fill them with your favorite liquid products without the fear of wasting any- their soft plastic teardrop shape and ensures you’ll get every last drop of shampoo. Compact, lightweight and sturdy: the trifecta of qualities that customers most desire when shopping for luggage. 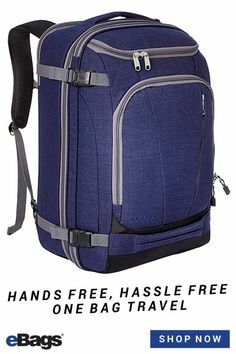 We love how the Travelers Club Madison 20” Hardside Expandable Carry-On Spinner has wheels that’ll let you twist and turn in 360-degrees, not just forward and backward. Exercise your right to free expression by purchasing this suitcase in a fun color like teal, pink, purple or even chevron print. Plus, just in case you go a little overboard in the souvenir shop; this luggage expands to save the day. 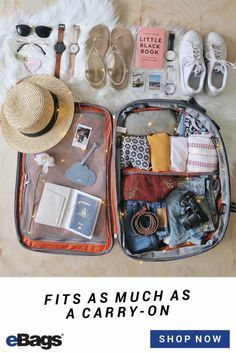 A wheeled suitcase is ideal for air travel but unfortunately doesn’t come with all the organizational pockets that backpacks or tote bags boast. 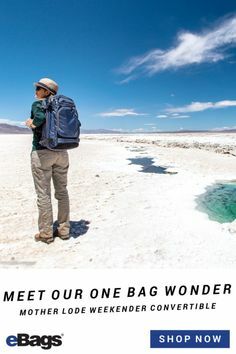 Therefore, we strongly suggest you invest in eBags ultralight packing cubes. Compartmentalizing your goods is a proven sanity saver. Assign one bag to a clothing type to make getting dressed a breeze. Hip hip hooray, you’re organized and packed and ready to celebrate the USA! You used the promotional code FIREWORKS to save 20% on bestsellers all over eBags.com, so you look fresh and fantastic. No matter what bag you bring or what National treasure you visit, don’t worry: you’re in the land of the free good vibes.